The Blue Room is a well appointed space ideal for training courses, business meetings and presentations. 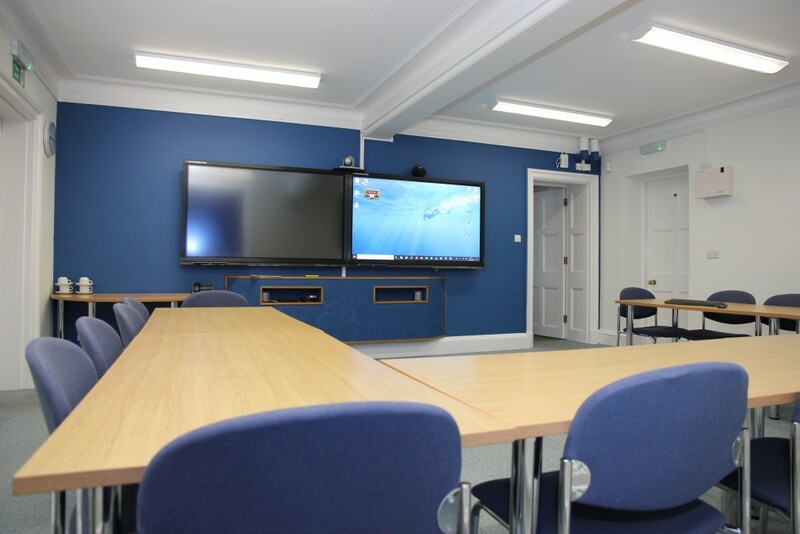 The Blue Room’s audio-visual facilities have recently been upgraded and now include: dual interactive 70” touch screens each with internet access, HD video conferencing with dual HD cameras, wireless presentation sharing for tablets and laptops, interactive white boarding, Wi-Fi and telephone conferencing. Seating is for 12 persons. The historic oak panelled Cedar Room has impressive views across the back lawns. This room is perfect for Board meetings and formal business meetings for up to 10 people. Formal lunches and buffets can also be served in this elegant room. The Jacobean Hall with its beamed ceiling, natural wooden floors and beautiful leaded windows can accommodate 70 delegates theatre style. It is perfect for larger seminars and workshops.